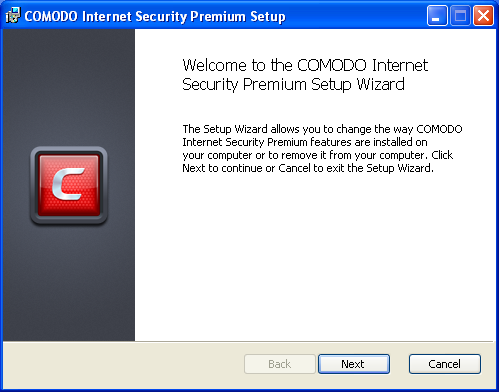 Comodo Internet Security provides the flexibility of installation as a complete security suite or as individual components. You can choose the installation type during the installation itself. Even after the installation, you can switch the installation type without the requirement of uninstallation of the software, retaining your configuration settings. You might have installed the CIS as complete suite initially but may want to retain the AV part or FW part and uninstall the other or vice versa. The inbuilt uninstaller of CIS enables to switch your installation type at any point of time. 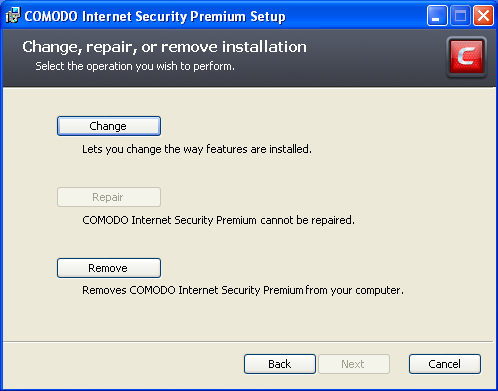 or click Start > Control Panel > Add/Remove Programs > Comodo Internet Security > Change. 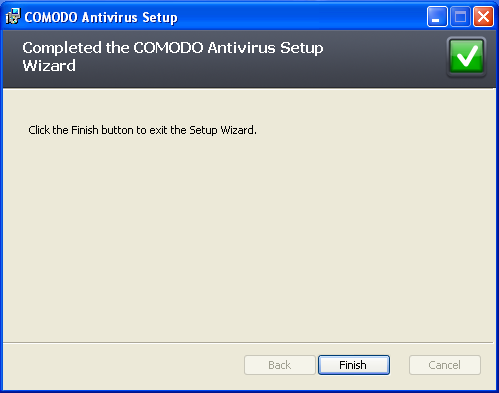 The Configuration Wizard will start. Click 'Next'. The configuration selection screen will appear. Select 'Change' button to change the installed features and click 'Next.' The Product Selection screen will appear. 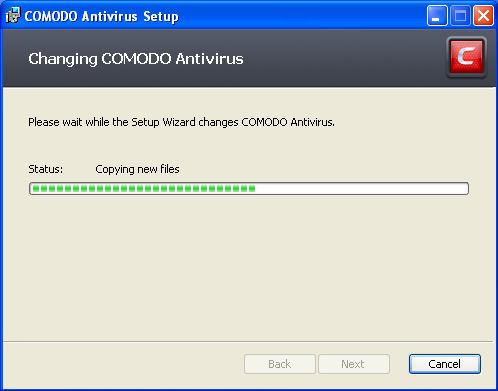 If you want the complete installation, select both Install COMODO Antivirus and Install COMODO Firewall. 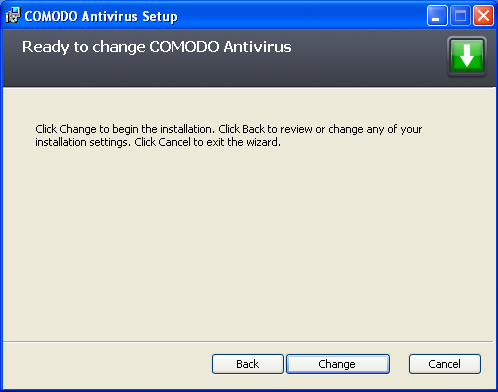 If you want only the Antivirus part and not the Firewall part, select only the Install COMODO Antivirus and uncheck Install COMODO Firewall. 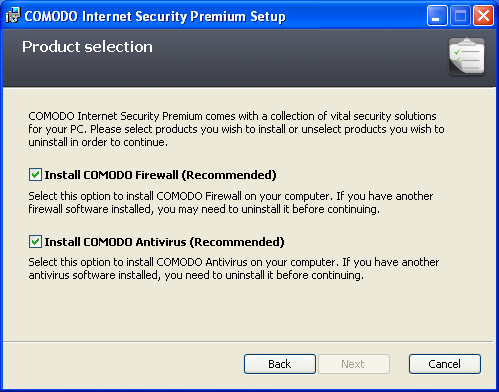 If you want only the Firewall part and not the Antivirus part, select only the Install COMODO Firewall and uncheck Install COMODO Antivirus. Click here for more details on the installation of individual components. Click 'Next'. Wait till the CIS is configured and is ready for the change. Click 'Change' in the next screen. The change progress will be indicated. …and on completion, Click the Finish button to exit the wizard. In order for the configuration change to take effect, your computer needs to be restarted. Note: The change will take effect only on the next restart of the computer.